Matthew Kelly is a front runner in the Catholic speaking circuit. He has written numerous books including Rediscover Catholicism and The Four Signs of a Dynamic Catholic. He is the founder of Dynamic Catholic. Over the last several years he has grown in popularity. While this is great for him, his methods are effective for a minute few, and ineffective for the vast majority of practicing Catholics. I used to be a huge fan of Matthew Kelly. I have a lot of his talks, a couple of his books, and I would give out copies of Rediscover Catholicism to lapsed Catholics. You can even find many mentions of him throughout this blog. Matthew Kelly has played a role in my desire to learn more about the faith. However, having gained the knowledge I now have, I’ve realized that Matthew Kelly doesn’t teach Catholicism in its entirety. His approach is laced with modernism, rooted in emotionalism, and waters down Catholic identity to appeal to a Protestant mentality. During recent years, parishes across the country have been giving out copies of Rediscover Catholicism to those in attendance at Christmas and Easter Masses. The concept is to re-engage Catholics who are only coming to Mass on Christmas and Easter. The program seemed to have an impact, as many people across the country were coming back to the Catholic Church. While I have no complaints about bringing people back to the Church, I do have a serious concern about methods that use emotion as opposed to logic and reason. Rediscover Catholicism is a book written for a very specific audience. It’s written for those who hardly identify as Catholic, or who have left the Church completely. It’s an appetizer to the grand banquet of Catholic cuisine. The book’s purpose is to present the case for Catholicism simply and pithily. It only scrapes the surface and doesn’t dig deeply. It relies heavily on emotion and sentimentalism. The introductory story of Rediscover Catholicism is meant to be a parable of God the Father giving up Jesus Christ, His Only Son. The analogy is incomplete unless the reader has a devotion to Jesus in the Eucharist. In Kelly’s example, the parents decide to sacrifice their son, ignore his pleas for help and knowledge, and leave him questioning as his parents abandon him. There is a significant difference between Kelly’s tale and the sacrifice Jesus willingly embraced in order to bring eternal life to the world. Jesus knew what was involved and what was to come of His passion. This boy did not know what was going on. Allowing your child to choose to give up their life to save those around them, and volunteering your child without their consent are two vastly different theological choices. With Jesus, we see a sacrifice of choice. With Kelly, we see a forced victim. Jesus laid down His life willingly for others. Kelly’s tale is contrived, an artificial and incomplete analogy. The Rediscover Catholicism and Dynamic Catholic Institute mentalities are awash in modernism. Modernism was deemed heresy by Pope St. Pius X, and described as the synthesis of all heresies. Modernism reveals itself by presenting something very traditional and recognizably Catholic in one context, and something very non-Catholic almost as a counterpoint, or a contradiction, attached to it. An example of modernism would be an author talking about how important Catholic identity is on one page of his book, and on the next page discuss how each person can worship however they feel brings them closer to God. They exercise all their ingenuity in an effort to weaken the force and falsify the character of tradition, so as to rob it of all its weight and authority. But for Catholics nothing will remove the authority of the second Council of Nicea, where it condemns those “who dare, after the impious fashion of heretics, to deride the ecclesiastical traditions, to invent novelties of some kind…or endeavor by malice or craft to overthrow any one of the legitimate traditions of the Catholic Church”. Many parishes are beginning to switch over from traditional catechetical programs and are using Rediscover Catholicism and other programs by the Dynamic Catholic Institute as their course material. This would be the equivalent of using a hammer to pound in a screw. You are using a tool which has an already intended purpose in a way in which it was not intended. At one time I was convinced that using Matthew Kelly’s methods would be the most effective way to get people interested in Catholicism. I attended his Living Life with Passion and Purpose event. I was even ecstatic when the Archdiocese of St. Paul and Minneapolis partnered with him to create the “Rediscover Faith” series which was incorporated in each parish within the Archdiocese. I was thrilled about the “Rediscover Catholic Celebration” conference the Archdiocese hosted in 2013 which was attended by 5,000 Catholics. Looking back, Rediscover Catholicism is a very basic explanation of Christianity. There is so much more to learn about Catholicism that requires us to engage material which is at a deeper level of understanding. From what I have seen, this program does not encourage the learner to look deeper into the more advanced subject matter, instead, enabling one to keep buying books at the same level of reason. While there is nothing wrong with simple explanations, to keep someone from advancing in their faith is sinful. A pre-school teacher not only gives his students the information and knowledge required to advance to Kindergarten, but also encourages the skills and curiosity to want to learn. Likewise, a Kindergarten teacher teaches the knowledge and skills required of his students to advance to First Grade. Additionally, if the subject matter is mired in Modernist philosophies, then the experience will be confusing at best and discouraging at worst. Heresy leads us further from Christ, not closer. According to Kelly, 85% of Catholics leave the Church within seven years of being confirmed. Last year, Matthew Kelly released Decision Point, a confirmation program designed to address this problem. Having taught Religious Education to 10th and 11th graders going into Confirmation (confirming children at this age is part of the problem), I was excited. I recall that in one of Father Robert Barron’s talks, he mentions a problem with Catholic schools. At his niece’s high school graduation party, she had displayed all of her books from her senior year. Included were books on Calculus, Chemistry, Physics, and many books in Latin. When Father Barron got to her religion book, it was a thin book in which all the pages were cartoonish and the subject matter was what was to be expected for a child. We are teaching high school students advanced academic and sociological material, yet we can’t give them anything intellectually challenging or stimulating in regard to the Catholic faith. I bring this up because every page of Decision Point is littered with random doodles. Every page. Additionally, the subject matter is light. From my perusal, there was no explanation about the consequences of Hell, nor even mention of Hell. There was no mention of Purgatory. There were no explanations of mortal or venial sin. Zero references to the Devil, but one mention of Satan when Kelly quotes the Renewal of Baptism formula (pg. 259). There is one mention of original sin. But, rest assured, there are at least 75 references to Kelly’s self-coined “Best-Version-Of-Yourself” mantra to instill a sense of the feel-goods. If this book is meant for Catholics in middle school and high school, why are we treating them like toddlers? There are lots of reasons you should stay Catholic and grow in your faith every day, but what is more compelling than to say, “You should stay because Jesus prayed you would”? There in the garden of Gethsemane two thousand years ago Jesus agonized over every person who would think about leaving his Church, and he prayed that they would remain one. – Decision Points pg 223. Matthew Kelly says “there are lots of reasons” to stay Catholic, but uses a weak reason rooted in sentimentalism to try to make you feel bad. He doesn’t discuss it being the Church that Christ started as the reason. He doesn’t talk about Extra Ecclesiam Nulla Salus which is the Catholic Doctrine that states there is no salvation outside of the Catholic Church. Instead of using logic and reason to engage the maturing Christian reader into making a lasting decision on why they should be Catholic, he uses sentimentalism and emotions to persuade them to be Catholic. Essentially, “not being Catholic makes Jesus sad” is his reasoning. Sentimentalism emerges in most of Kelly’s language. “The Best Version of Yourself” is a term Kelly began using after he read the Second Vatican Council’s declaration stating the universal call to holiness. When teaching this declaration, many people would shrug off the idea of holiness. He began using this catch-phrase and people responded positively. While changing the language a bit to help drive a point (Jesus did this with His parables), it’s important to remember that context is needed. This phrase only works when you apply a lens of holiness and God’s law to it. Any other lens and this phrase can be used to promote a litany of sins. Eventually, this blossoms fully into the mentality of “feel good Catholicism”. If the teaching is too hard, too old, or doesn’t leave you with a feeling of joy, then it isn’t good. This can be seen in 2014’s “Rediscover Catholic Celebration” put on by the Archdiocese of St. Paul and Minneapolis. There was no mention of having a reverent Mass. Everything had to feel good. No classical Gregorian Chant, but plenty of Modernist Praise and Worship tunes. No time for deep contemplation, but enough time to do a “flash mob” to a rendition of Pharrell’s “Happy“. Planners had reserved room for 10,000 people. Only 5,000 came. At this event, they discussed the brand new program they were going to launch; “Amazing Parish”. Amazing Parish is similar to “Rebuilt” in which we forego most of our Catholic identity in all facets of parish life to appear more Protestant friendly and appeal to those leaving the Catholic Church for Mega-Churches. It is important to note that this “mega-church” mentality doesn’t work. Parishes that embrace tradition and reverent Masses are the parishes which see a boost in parish attendance and tithing. The Church in general has been trying to appear more Protestant for the last 50 years and are seeing the fruits manifest in the problems we face; priest shortages, vocation declines, parishes merging/clustering/closing. Becoming more Protestant won’t fix the problem. There are plenty of liturgical abuses in many Masses across the world. Taking issue with these abuses is normal and good. Matthew Kelly is a firm believer that those who take issue with these abuses are the ones who have the problem, not the priests who allow the transgressions. The complainers have an imperfect heart for not appreciating Jesus Christ’s presence in the Eucharist. Ultimately, this logic reduces one to accept “clown Masses are okay, and if you have a problem with it, you are deficient in your faith”. The works of Matthew Kelly were a stepping stone in my faith, but his approach is insufficient. His books are simple, and don’t touch upon the important aspects of the Catholic faith. Each person is unique and different, and each person is entitled to hear the fullness of the Truth. There are plenty of resources written prior to 1965 that explain Catholicism concisely and provide plenty of meat to chew on for both Catholics and non-Catholics alike. I would highly recommend reading St. Peter Canisius’ “Catechism for Catholics” to get a solid understanding of Catholic teaching. There are some good nuggets in what Matthew Kelly has to offer, but due to the Modernism that is laced throughout much of his material, it would be best to avoid it and stick to the catechetical material which has been developed throughout the history of the Church. Finally, while these novel methods may bring an influx of people into the Church the methods do not have the lasting effects would the methods that the Church has had at her disposal over the last 2000 years. I don’t think Matthew Kelly embraces Modernism intentionally. I believe he’s a product of the catechesis of his day. The Church has suffered greatly these last 50+ years in catechesis and the knowledge and attitude of today’s Catholics demonstrates it. Matthew Kelly has a gentle demeanor which many find attractive. If he would embrace traditional teachings and present them clearly, he would make many Catholics stronger in their faith, a faith which will last longer than the popularity of his latest book. The Traditional Latin Mass, the Baltimore Catechism, and traditional Catechesis have plenty of substance to feed the faithful and an 80% retention rate prior to 1965. New ways to present classic material come out each year which tries to address the now 15% retention rate, and fail. Perhaps we should use what the Church has always used: good old fashioned Truth. Thank you, Jeff. So well stated; how many devout, obedient Catholics will find their own sentiments expressed in what you have written and experienced. I sure did. The devout, obedient, properly educated faithful have much to suffer in our times and must continue teaching people properly and providing very necessary, and often entirely absent, support for one another, our Lord and Blessed Mother’s Catholic Special Forces. Often, our own parishes have become hostile environments for the obedient devout faithful despite the mostly well intended efforts of the masses as this material is eagerly distributed for the sake of all. (“Don’t teach me correctly” they beg you, “STOP COMPLAINING, here take this book…”) EYES ROLLING. Let us continue to pray that minds are illuminated and hearts be warmed, and that more people seek to serve God on His terms and not our own or those of others who tell us so well what they and we want to hear. Fair, well balanced argument. You show great charity in exposing the lack of fruit regarding this movement. I appreciate that. I agree with most of what you wrote. One question I have about our parishes that re-introduce beautiful, reverent liturgy: what percentage of the increase in membership and tithing is composed of “lapsed Catholics” coming back to the Faith, compared to engaged, hungry Catholics who are already engaged at another parish, and simply change their membership or where they worship/tithe? I’d be interested to know how those groups compare. You mentioned both how Matthew Kelly was a significant stepping stone for your faith, and how “Rediscover Catholicism” and other Kelly works are ineffective for the vast majority of practicing Catholics. I’m not sure that’s the audience to whom Kelly is writing. His books are more trying to reengage a generation of lapsed, lax, or Catholics. And in a culture whose chief characteristic may be the ultimate drive for pleasure, don’t works like Kelly’s expose Christ as the true source of any lasting joy? I know that to be his main message when talking to the unchurched. I completely agree about Decision Point, and that is the reason I do not implement in the parish at which I work. And I agree that we need to be giving more meat to our Catholics who are involved in Mass; something beyond “Rediscover Catholicism” and the like. However, I do believe works like Kelly’s can be used to be a launching point for many people. It is the fault of our parishes if his works are used incorrectly. Like you wrote, Matthew Kelly had an impact on your faith. I’ve heard many stories of the same; now let us guide those people to the real deal, once they’ve had a taste. I really enjoyed reading this article and you put in a lot of work with excellent references. I appreciate your thoroughness. I would like to stand up for Matthew Kelly just a little bit though. While I also appreciate the traditional Mass and keeping more reverence in our Catholic activities instead of devolving into showiness and stage performing, you have to meet people where they are at. When I meet someone who isn’t Catholic at all or who is a Christmas/Easter Catholic (which usually means they aren’t living a Catholic life at all), they are always hurting. I know they’re hurting because life without Jesus hurts. And in that moment, when I’m looking into their eyes filled with confusion because their life continues to feel unsatisfying no matter what they try, they need hope. They need love. They need what Jesus has for them. We have to capture their attention somehow and Matthew Kelly is attempting to do that at the elementary level that most Americans process information these days. I don’t think his call to holiness or his challenge to be the Best Version of Yourself are shallow or based on feel-good tactics though. After one of his conferences, I found myself reading my Magnificat every day, going to confession every month and really paying attention at Mass by writing things down in my Mass journal. Those things have all deeply affected my life and as I continue to improve myself, I’m reading older and more traditional texts about the church. Catholicism has a way of feeling like a members only club. If you don’t know all the right things or do all the right things, you don’t belong. And I believe that is one of the things that turns people off the most. While I don’t think we should woo people with coffee in our pews or flash mobs during Mass, I don’t think it’s wrong to create more programs that reach people where they are at so we can keep them long enough to teach them the deep and meaningful things. I think that’s what Rebuilt is attempting to do. When I encounter people interested in Catholicism, I start them off slowly. I give them simple books to read, like Matthew Kelly’s book. Then as they become more educated and invested, I give them more challenging books to read and more traditional views to consider about our great church. Our church has the truth on her side and that will always be attractive to people. But sometimes they come to us with worldly blinders on and they’re not ready to see or appreciate that truth. I think if you sat down and had dinner with Matthew Kelly, he too would say he wished things could be deeper and more traditional. But we cannot cling to that idea in our ivory towers while the world around us devolves into reality television and commercialism and just accept the losses of souls. We must fight for people to know Jesus. We have to bring them to Him and trust that He will work in their lives. We can hope that all of us will continue to learn more, read more and appreciate tradition as well as sacrifice until we become saints ourselves! I think Matthew Kelly is doing more good than harm and we cannot lay the shallowness of our culture at his feet. He is trying to grab who he can and raise them up. He may not do that successfully with all people and some people may do it wrong and create a party where there should be reverence but that can’t be a reason to stop trying. I love that you’re talking about it. I love your site. I appreciate that what you’ve said was said politely and with good intentions and I believe, love. I think we need to spend lots more time talking about our Catholic faith and trying to integrate it into the world! Well said, throwing people into the deep end of theological thought and philosophy will more than likely scare them away rather than engage them and spark an interest and thirst for deeper knowledge of our faith. If you toss a log onto a small fire, you will smother it. If you feed the small flame with smaller and then bigger twigs and branches, soon you will have a bonfire of faith burning brightly for all to see. While you have a good analogy, the problem is that what Matthew Kelly gives is not Catholicism. It is Protestantism packaged as Catholicism. Even worse, it is modernism cleverly disguised as Catholicism by playing on the emotional aspects of the reader. The genius of Catholicism, to borrow Matthew Kelly’s wording, is that the giant log of Catholic thought, can itself be broken down into sticks, twigs, branches or whatever size is necessary for the individual. What Matthew Kelly gives us is not even wood, but some synthetic material that gives us a huge flash of light, but quickly fizzles out. YES, Sterling Jaquith. This is exactly what I was thinking. Mathew Kelly is not a one stop shop. I don’t think he’d say that about his work either. He is the introductory level for the beginner who, having tasted life with Christ, will seek depth on his own. That’s how it was for me. There are many parts, and one body. God bless! There is a very important distinction to be made between Matthew Kelly and Tom Corcoran/Fr. Michael White, the authors of Rebuilt and the leads of Amazing Parish. Mr. Corcoran and Fr. White painstakingly demonstrate the process they used to discern the needs of the people of their parish. They cite many, many Church documents. They collaborated with their Ordinary. They do NOT advocate universal use of mega-church tactics in their book. They utilize small groups in their parish to form Catholic disciples, drawing them ever closer to Christ, not to help the people “feel good.” While I agree with your analysis of Matthew Kelly’s work, which does a good job of attracting people at first but does not lead to growth as Catholics, I do not agree with your opinion regarding Rebuilt and Amazing Parish. We need to do both – to proclaim the gospel in ways appealing to the people in the society in which we find ourselves – AND – to foster disciples of Jesus Christ in the Church He founded. Given how far our society is from Catholic values and worldview, we have a long bridge to build. More needs to be done. Going back to the 16th century isn’t the answer. Bringing all 20 centuries of Catholic thought and worship into the 21st century in ways in which the various elements can be appreciated and appropriated into individual lives and, someday, into expression throughout society again, is what is needed necessary. We must bring them in, then help them along the path to holiness. Rebuilt was used to completely demolish any last vestiges of Tradition in my now former parish. Perhaps a few of their ideas are all right, but if you read the accompanying book on implementing Rebuilt, it’s a ‘my way or the highway’ approach. Coincidentally (? ), attendance and the collection is way down. Perhaps it wasn’t the fault of Latin after all…. Spot on. You did an outstanding job at exposing the difficulties with Decision Point, and in a very charitable manner. “…it was a thin book in which all the pages were cartoonish and the subject matter was what was to be expected for a child…” Yes. I teach 6th-grade catechism, and finally eliminated the textbook and start teaching Catholicism from the Bible instead. I don’t think anyone responds well to condescension. Get a copy of the Baltimore Catechism. It teaches the true Catholic faith in a question and answer format that even a 6th-grader can understand. Thanks so much for writing this. I posted a brief comment at NCRegister about this same topic when they covered Kelly’s parish programs. Why do they keep pushing pablum at the typical parishes? It’s almost like they don’t want anyone to advance beyond a third grade understanding of the Faith. I’m not sure how much more a TLM parish takes in per family, but I know that my family more than doubled our giving once we started attending one. Our pastor frequently mentions how generous the parishioners are, especially considering that we have very traditional families, many with a single breadwinner and larger than typical family size. baby steps, folks, baby steps. Matthew provides a great service to those of us who, God bless us, aren’t smart enough to tackle St. Augustine or St. John of the Cross or St. Julian Eymard (heck, I don’t even know if I have that right – just writing off the top of my head right now) but he whets the appetite and prompted so many like myself to hunger for more. I agree 100% with the last paragraph of the article. But until people begin to learn the value of these teaching truths, you gotta spoon feed. The Apostles seemed able to convince people of the Truth who is Jesus Christ without the use of the Bible, the Internet, video’s or any modern tools. They did so by simply telling the truth and living the truth. That is what modern man needs, as all men need-the telling of the truth and leading by example. That is how to get young people interested in the Catholic faith. The author makes great points. Kelly’s works are great stepping stones. I read Rebuilt before rediscovering Catholicism. Matthew kelly was a breath of fresh air compared to fr whites book. The first 30 pages are spot on with explaining the crisis. The rest of the book, fr whites solution is a bit off the mark. Fr white goes to extent to remove the sacramental aspects of the faith from their speech and website. His parish is booming but the availability of confessions and adoration show the shallow poverty of the parish life. Matthew kelly is 3 steps above that. If you want to attract men back to church then give them meat and potatoes catholicism. Challenge them. Love Matthew Kelly. Have read numerous books and seen him speak. Yes he can be a bit Catholic light at moments but he is true to teaching. He can be a bit like a baptist preacher in his delivery but passion can be contagious. He pushes reading the gospels, going to confession and placing mass as a priority in your life and engaging in it. In a time where our church numbers are dwindling if he gets the ball rolling I say God bless him. Anyone taking away from that is missing an opportunity to grow our church. Is it more important to be small and have everything perfect or a larger congregation that has the opportunity each and every week to grow in their faith? Pope Benedict answered your question. He said it was better to be small and true. I believe the point of Matthew Kelly is to re-engage. It’s a springboard. He is not pretending to be a theologian or an expert, but he is trying to meet people where they are and bring them back to explore more, to read the Gospels, to go to Mass and engage in it, to respect our traditions, to embrace reconciliation, to revere the Eucharist. Then we can each be small but true. If we don’t take steps to re-engage by way of teaching what our faith teaches and the richness of it all, then we’ll be a dying breed. So I agree with your statement wholly, and I too love Matthew Kelly. I love that he is out there reinvigorating a lot of people. Because of Rediscover Catholicism, I find myself searching for deeper meanings, reading the Bible, and embracing my faith with the goal to learn more about it. The CCC might be spot on in terms of theory, but I don’t think that would’ve been my first step, my first read, in re-engaging. To address some of what is stated in this article, I think some of it is taken out of context and glossed over as well. Kelly isn’t trying to turn anything into Protestantism. If anything, he is making a plea to get us all to learn more about Catholicism to preserve our traditions. So, bless him, yes, for going out there and appealing to the masses, so we may return to being proud of our faith and become men and women of action. I’m ok with frosting if it leads me not just to the cake, but also to the recipe and the chemistry behind it. This reminds me of when I was doing consulting work for top executives in silicon valley in the boom times. Not a year went by that a corporation did not “re-brand” or “re-envision” itself or try to wrest devotion and hard work from its employees with “team building,” group dynamics, communication exercises, pep-talk seminars and the latest “how to succeed” book. These books are still coming out and are still bestsellers. All of this is great but it’s frosting. If you don’t have a solid product, well-educated employees and management with a clear vision, all the hoopla and rallies and re-packaging are not going to bring the company success in the long run. Why am I yammering on about corporations? Because it seems that priests and even bishops have come to look at their parishes as a business. It’s not the quality of the product or the long-term strategy (knowing and serving God) that matters, it’s numbers and short-term effects. How many dollars in the special collection or bishop’s appeal? How many baptisms or regular mass goers? How much growth? These are short-term and superficial ways to “strategize” about how to secure souls for heaven. The Church is not, as the pope said, an NGO or a big non-profit. Nor is it a business and we need to stop treating it as such with the modernistic tools (statistics and emotionalism) we have come to believe express reality but are often mere deceptions. They have all been infected with Modernism which calls for constant change, action, and fluidity so that the people are confused about the true faith and easily manipulated into believing the heresies it teaches. This is the tactic of the revolutionary and the enemies of Christ and His Church use it constantly in all of their writings, their preaching and teaching, and in their “educational” programs. 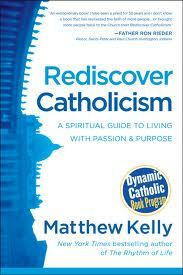 Wow, this article totally opened my eyes about Rediscover Catholicism and the Matthew Kelly movement. I, too, have been a fan of his, but I always felt like his books and talks didn’t hit the “meat and potatoes,” the substance of our Faith. I was left hungering for the depth that seems to be so lacking everywhere. I love your quotes from his books and how you defined modernism, which I had long forgotten from Philosophy class 15+ years ago. This article definitely put everything into perspective – we need to be teaching the Truth, not watered down, but presenting the substance of all we believe with confidence and in charity. Fantastic post, Jeff. I see the point people are making about Kelly ‘meeting them where they are,’ but ultimately they’re not being given the fullness of the faith or really even its truth. Why would you start ANYONE out with sentimental squish? Proper catechetical training doesn’t even start children out that way. If someone wants to start at the beginning, look no further than the Baltimore Catechism. I truly believe that coming into the Church through Kelly’s philosophies will result in cafeteria Catholics at best. Because I have watched more and more people leave our own parish year after year because they are being preached at as if they are already in the 7 % and they are not ready for that. They need the squish that you are referring to. They can be given the fullness of the faith as they are open to it but you cannot teach someone by forcing it on them. Forcing it on people causes people to disengaged and eventually leave. Those people are leaving year after year because they are not being preached at at all. What happened to fear of the Lord? I don’t start my children out with Jesus loves you songs, I start out explaining the difference between mortal and venial sins, and what it means to be in a state of Grace. I’m just saying that everyone needs catechizing and you don’t start catechizing with sentimentality. You start with the Truth, even when it’s hard. If a seven-year-old can be taught about the ramifications of their actions and the four last things (death, judgment, heaven, and hell), then the average parishioner needs to hear that, too. Emotionalism and sentimentality is exactly what got us here. I must agree with many of these posts as far as how to attract people to the Catholic Church. It seems that the Matthew Kelly material is just right for protestants and those who we are trying to get back into the Church. Once there, it appears we need a much more advanced program. This is where I see the real problem. Where do you go with people once they have finished RCIA? I attend a small TLM parish and this is where I see a real failing. The priests at the TLM parish have lighted my faith on fire and I try to devour everything I can that is Catholic. Prior to this parish, I tried several Novus Ordo parishes to find only one advanced Catholic training in a Bible study and it was heretical. At the TLM parish every week our Sunday sermon and daily masses are deeper training in the faith, but it would be great to have Bible study or something so we can interact with others and share our experiences/thoughts with each other. Thankfully we have breakfast and lunch after Sunday Masses but these are for community building, not catechizing. Our parish is growing but for many, it doesn’t give them everything they need to continue to move forward in the faith. Perhaps this is what Vatican II was really trying to give us. But what many of you don’t realize is that you are part of the 7% the Matt is not trying to engage. He is trying to engage the other 93% of Catholics who have either already disengaged or on their way out the door. This material is not meant as substance for us who are already engaged and need something more, but it can help us reach out to our brothers and sisters who are struggling to stay Catholic. If you believe in God and believe that Jesus Christ instituted the Catholic Church, you need to get out of the counterfeit, Novus Ordo, Modernist church born in the Second Vatican Council NOW. Your salvation depends upon believing and living the Truth. So you credit Matthew Kelly with helping you come to your Catholic faith but then spend an entire blog post in criticism or at least questioning his approach? Maybe just a “thank you” for helping you on your journey would be appropriate? Perhaps you wouldn’t be in the position you are in with your faith today if it hadn’t been for his work. I am a fan and supporter of Dynamic Catholic. I think the work they are doing is trying to put people back onto a path to the beauty and truth of the Catholic faith. It isn’t intended to be an end all/be all. It is a starting place. There are plenty of other wonderful resources to go deep in the faith once you are interested in doing so. That has happened to me through Dynamic Catholic and the Pardisius Dei program called That Man Is You. Like it or not, we will not win people back to Catholicism by starting the conversation with talk of heaven and hell and the most controversial social issues of our day. Meet people where they are and draw them closer. Pretty sure that’s how God works. It’s how he has worked with me. Rick, I never said that Matthew Kelly was responsible for me coming to my faith. I’m a convert and Matthew Kelly had ZERO role in that, but Our Lady of Fatima did. While Matthew Kelly lent a hand for a little while in the beginning stages of my faith, I soon realized that he was incorrect in what he had to peddle. Would it make sense to allow someone to continue in error by telling them “thank you”, or would it make more sense to HELP THEM grow in their faith? We are at a critical point in the Church and I disagree with you that we can’t win people at about talking about Heaven and Hell, as that is what led to my conversion. Jesus Christ preached that if you don’t accept Him you will face the unending fires of Hell. If it was good enough for Jesus, then it is good enough for me. Rediscover Catholiciam is an intro or re-intro level book. He uses story telling and humor to break the ice in a oerson’s soul, not change the Church. I read it, saw and heard him speak, and our parish did a book study of RC, which is a compilation of several of his talks. We modified the study guide quite extensively to deepen the impact as we had people at various rungs of the ladder of faith, but the book was was ok for its purpose — attracting people to a point of trust and curiosity about becoming an intentional disciple of Jesus in the Church. People wanted to deepen their faith after the book program but our parish was not prepared with Bible or Catechism studies. Because of this they asked for an “anniversary” reunion. We did a follow up meeting one year later, and people said it changed them–they were praying more, attending mass more, going deeper into the faith, than before reading the book. They were hungry for solid food now that they had advanced beyond the milk stage. The book program helped them decide they were willing to become saints–the best version of themselves– in God’s design. If there is no where to go or no parish support after reading the book or seeing the videos, they will end up becoming the seeds upon rocky ground. The Bible, catechism and Confession are too scary or irrelevant to young people without a person to attract them to God’s genius and his gifts to us — his salvific death and resurrection, the Catholic Church, sacraments, Mary etc. That is where every one in these comments comes in: use your energy to Cultivate the seeds that have been planted by books such as RC, grow the souls. Forming Intentional Disciples (a book by Sherry Weddell and a fruit of Dominican collaboration) and Siena.org is very insightful helping people at different levels of conversion/spiritual life. MK’s target groups are the first 1-2 levels of conversion. Help people encounter Jesus on the cross and through the sacraments rather condemn them. Bring them to the next level or all the way to sainthood, wherever your graces are given to you. I have never cared for Matthew Kelley. He has the fervor of a Protestant evangelist. His philosophy seems man centered and awash in Modernism. Unfortunately my Parish and diocese is all about Modernism. We need to get back to the Traditions that made the Church strong. In the last 50 years, this new way has been an assault on the Mass. Why people defend this is mind boggling. His work is drenched in sentimentalism and any religious endevour that uses sentimentalism and emotions to convey anything is a man centered, narcissistic enterprise. I have had experiences with lapsed/lukewarm/ignorant Catholics where they encounter authentic Catholic truths (introduced gently/step by step but firmly and fully)and they are startled by it, they embrace it and because they have good will they are converted because they are inexplicably drawn to truth. They also many times complain, why were they never taught these truths. Protestant inspired evangelizing will never work.